The turning point for Cline originated in his decision to enroll in community college. Community colleges, unlike most four-year universities in the state, do not ask about criminal records, and they offer classes to people at all skill levels. The relationships and the mentorship Cline received during that period ultimately led to his academic and career achievements. Cline grew up in Chicago’s Bronzeville neighborhood where he lived with his mother, a social worker. He says he got decent grades, and he loved playing basketball. Early in his freshman year of high school, Cline said he was walking home from a basketball game with a friend when the police pulled up. They took him and his friend to the home of a woman who Cline says wrongfully accused him of robbing her at gunpoint. Cline was sentenced to time in the state’s juvenile correction system. Later, he said, law enforcement found the real culprit. Cline was released from juvenile detention, but the experience irrevocably changed his life. He said people in the neighborhood saw him as an ex-convict, regardless of his innocence. “You know where I come from it was like, ‘Oh man, he was locked up.’ So that tough exterior took over me, you know. And I started to transform into something I really wasn’t,” Cline said. On top of that, Cline said, his high school failed him; he didn’t receive the academic or mental health support he now realizes he needed at the time. He dropped out his senior year. Cline said he began hanging out with gangs, doing drugs and committing crimes. He was in and out of state prison throughout the 1990s. And then, he said, he got addicted to heroin. His brother died of a heroin overdose in 2006. On the way to his brother’s funeral, Cline said he also overdosed on heroin and wound up in the hospital. It took the death of a friend seven years later for Cline to finally make a change, he said. It was April 2013 and Cline was using heroin with a friend he called “Tall.” Tall was in a wheelchair, and Cline said he could tell he wasn’t feeling well. But instead of trying to get help, Cline left to get more heroin. The next day, a friend called Cline and told him that Tall had died from an overdose. That intervention came in the form of a bus ticket, which an old girlfriend bought Cline so he could go from Chicago to Champaign, shortly after his friend’s death. When he arrived in the university town, Cline was homeless and in withdrawal. He started going to Narcotics Anonymous meetings regularly. He said his life began to gradually improve, and he developed a support system through the group. Cline had earned his GED while in prison, and he told a friend from NA that he wanted to earn a college degree as well. “One day I was helping him move. And after we got through moving, he drove me right up to Parkland College. He said, ‘Get out, go register for school.’ And I did it,” Cline said. Everything about the community college was unfamiliar to Cline, but he said he was determined to get a degree. Cline said he took a placement test after he registered for school, and placed into remedial courses. Math, he said, was the toughest subject for him. “I had started like real low in math. It was like straight humiliation,” he said. What made the difference, though, was Cline’s ability to ask for help, and the help he received in response. Cline said he was taught in NA that “a closed mouth doesn’t get fed,” and he realized he needed to be open with his professors about the level of assistance he needed. 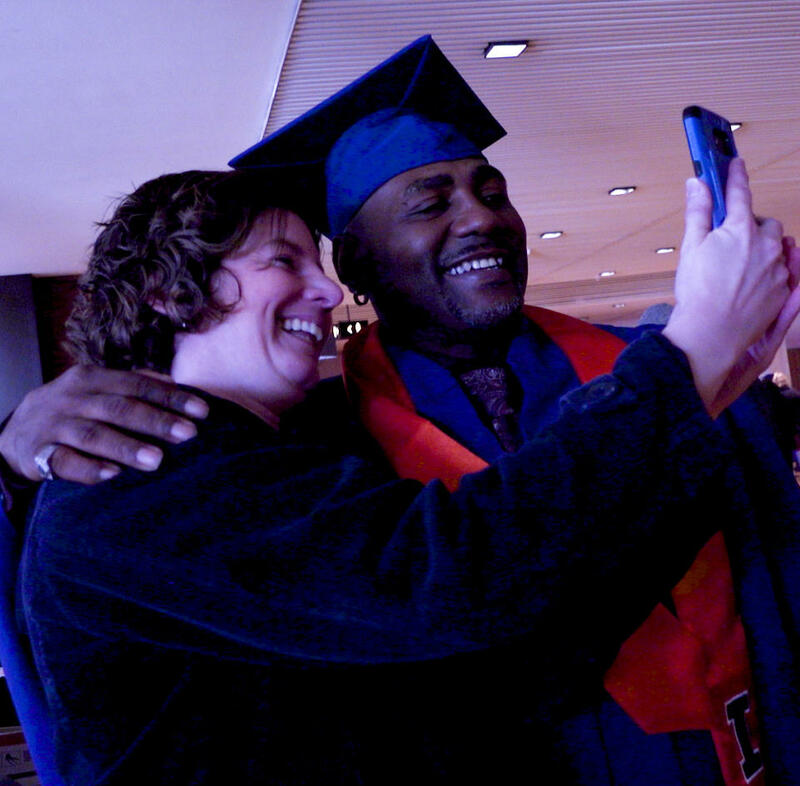 Parkland professor Dr. Erin Wilding-Martin and Perry Cline at Cline's graduation from the University of Illinois. Like Wilding-Martin, Cline’s academic advisor at Parkland, Larry Taylor, was also drawn to him. Encouragement was key to their relationship, he said. Cline earned his associate’s degree from Parkland in 2016, and Taylor urged him to apply to the University of Illinois’ School of Social Work program. But when Cline applied, he was initially turned down by the college. Taylor was “perplexed” by the college’s decision, and reached out to the U of I to tell them that Cline would be an asset to the program. Cline started at the U of I in the fall of 2016. 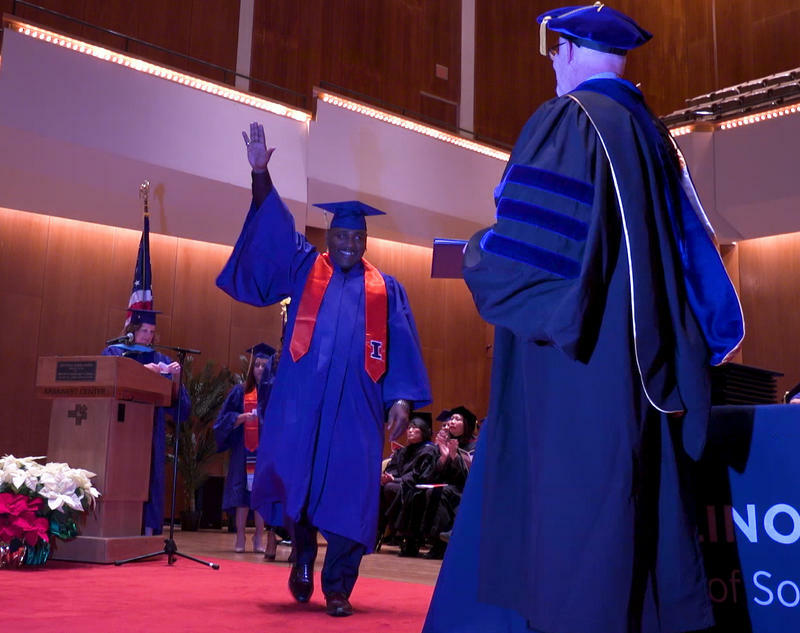 While in school, he co-founded a group called “Recovery Happens,” which operates several residential programs in the Champaign-Urbana community to help people struggling with addiction. Cline graduated with a bachelor’s degree from the U of I this past December. Taylor said Cline’s success is exceptional. “It’s not enough just to open the door to academia to them. There has to be a strong component of support,” Chaney said. He said that support takes the form of connecting formerly incarcerated students to organizations and community members who can help meet the basic needs of food, clothing and shelter. Beyond that, Chaney said, it’s important they find a support network inside and outside the school environment. “You also want to make sure that you have a navigator, somebody that can walk them through the transition from incarceration to the classroom, somebody who can kind of smooth out the very, very intimidating, sometimes confusing process of filling out applications and learning how to handle yourself in the classroom,” Chaney added. Schwartz said the emotional connections Cline built with his professors and advisors at Parkland are commonplace among formerly incarcerated students who are successful in earning their degrees. Schwartz and Chaney suggest that colleges who want to do a better job of helping formerly incarcerated students succeed should go a step further and visit people in prison to let them know that education is an option for them when they’re released. With a new sentencing reform law passed on the federal level, the professors say more people will soon be returning home from prison. “It behooves us to be ready not just in terms of handling the numbers but having the quality of the engagement once we do see the population coming our way,” Chaney said. Cline doesn’t believe he’s an exception. He says there’s a lot of people like him that could benefit from a college education. For him, he said, the opportunity to pursue a degree and the help he had along the way made all the difference in his life. “I mean it’s the floodgates to open up everything. I don’t care what happened to you, how your past went, who you were connected to, getting an education brings up so many possibilities,” Cline said. An education helped Cline find his purpose in life, he says that’s helping others. Cline plans to pursue a master’s degree in social work next. Update: This story has been changed to clarify the role community college played in Cline’s academic success.